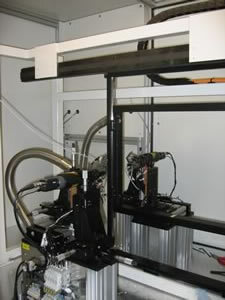 The image on the right shows a machine which is capable of welding a stainless steel pin every second to an accuracy of 50 microns. The pins are fed via a bowl feeder to the point of delivery and held in place with ceramic grippers while welding takes place. 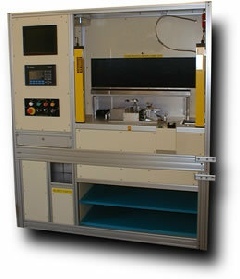 The image on the left shows a laser welding machine which is capable of taking manually loaded parts onto a rotary table and accurately welding small copper components onto a subframe. The customer is a tier one automotive supplier and safety and quality are critical. The laser beam provides a concentrated heat source, allowing for deep, narrow welds and high welding speeds. The process is frequently used in high volume applications where speed, accuracy and quality are required. The laser can produce either continuous or spot welds and maintains a small heat affected zone with minimal distortion. Using a beam management system makes it possible to distribute a beam from a single source to multiple stations. The welding laser can be integrated into a manual, semi-automated or fully automated assembly system depending on the application. As a systems integrator CS Automation can provide solutions for applications where standard laser welding systems are not appropriate.